There are currently 0 users and 245 guests online. Pac-Nam is a 64K intro using the ZZT engine that runs on MS-DOS PC or DOSBox and was released in 2018 by Nanoco. Pac-Nam is based on Amazing Maze, Pac-Man and Devil World. The total world and executable size is 65,536 bytes. 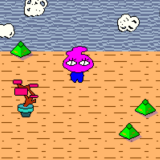 SMILEY ISLAND is ＶＡＰＯＲＷＡＲＥ. Please share it with your friends! It was developed from scratch in Klik & Play during the late 90s and has been resurrected. This is not your run of the mill platform game! 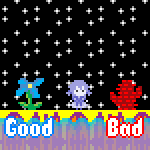 Smiley is based on Pac-Land and Super ZZT Land among others. Features include parallax scrolling frontwards and backwards, elegant collision detection, re-purposed arcade-style graphics and a full size course with room to spare! The project aims to push KNP's limits with only minor adjustments in Fusion for the WIN32 and HTML5 builds. Support the development of this game by donating. Thanks to FirecatFG for reminding me about my legacy. A bit of a "troll"/joke map here. But don't worry! It's very easy to complete. I just think it's amusing. Eat all pills and find the cherrypie to move onto next stage. Avoid ghosts. A tribute to Sinclair ZX Spectrum games. Eat all the stuff before the other mouth eat. Arrow keys to move.